Posted: March 17th, 2013 under HTML5, Opinion. The biggest event to happen to internet and mobile in a long time is the ongoing development of HTML5. Currently there is partial support but the new standard’s definition still isn’t finalized. I have no doubt that it will be a large advance for the web developers; my particular challenge was determining if HTML5 was going to outclass Flash for game development. Full disclosure, I am completely biased to Flash. I have been using it for several years now, I am an expert at it, I know it inside and out, and have amassed a collection of work and library of resources. As I mentioned in my article about new technology, since I am a veteran developer in the existing space, there needs to be a substantial improvement in capabilities for me to change technologies. I am invested in Flash (which evident to me after upgrading to CS6). I had been hearing whispers about HTML5 from as early as 2009, but it really didn’t get my attention until Adobe halted development of its mobile flash plug-in (no more support for flash embedded on web pages, AIR apps are continuing, and Adobe is working on a converter for flash to HTML5). The official statement from Adobe claims Flash’s future is going to be based on advanced gaming and premium video. Which inevitably led to Adobe laying off a large number of employees with their own vision for where things are going. For the next couple months I voraciously digested any article that was even half interesting on HTML5. So through the narrow lens of Flash veteran focused on game development, I am going to dissect this technology. Is it really ‘taking over’ or is it all hype? Is it as capable as other technologies? How much of the marketplace could it reach? Flash is really mature these days, revenue and traffic – particularly for Flash games, is still increasing. Flash is not standing still, with social gaming, pressure from other competitors like Unity 3D, Flash is growing in capabilities. Flash recently released version 11.3. As pervasive as Apple products are, there are actually more Android phones in the market than iPhones, and more people are targeting Andriods for game development. This article from May 2011 is now fairly dated (Firefox and Chrome have both surpassed IE in browser marketshare), but had the best breakdown of the market and browser support. Flash is already everywhere, and is supported by older browsers HTML5 will never run on. 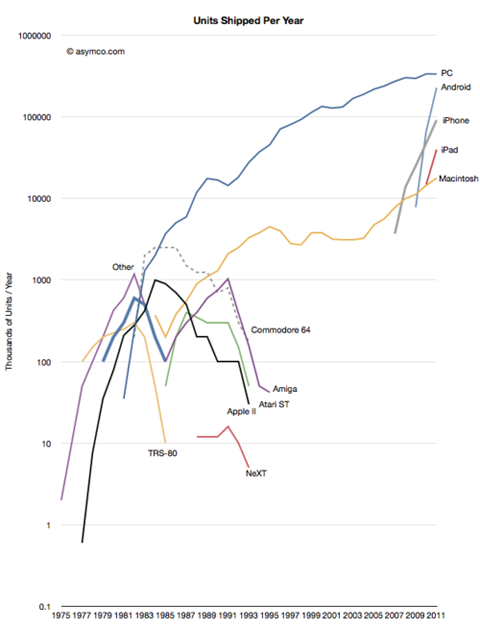 I also like this logarithmic graph that shows PC is an order of magnitude larger in existing devices than Mac, and more androids than iPhones and iPads put together. The future is a bit questionable, but I am going to build for what is out there right now. The Flash plug in doesn’t work on Apple product’s browsers because of politics, not because the technology is incapable of it. Also, Flash developers can still develop apps for mobile apple products via Adobe AIR, and there is evidence that it will be a while before HTML5 eclipses apps. While things are changing, Flash is not getting replaced, it isn’t even contracting. Currently HTML5 is still very rough around the edges. The Wall Street Journal had an insightful article that conceded that “The excitement has spread despite the fact that HTML5 is missing some key features. Many users, moreover, won’t notice striking differences from websites that use Flash.” I am not entirely sure what Flash’s future is going to be in an increasingly mobile world with browsers that refuse plug-ins, and without Adobe adding touch screen support. However, HTML5 is not without its flaws and uncertainties. Personally, I find the canvas really weak, and that is a big turn off. I have heard of, as well as seen, performance inconsistencies between using DOM or the canvas for rendering. I’ve complained about not having enough core support in Flash, the canvas is a step down from that – isn’t much more than a pixel painter. In order to just get running with basic elements, you need to hunt down 3rd party rendering / game engines or write one yourself. If you are in the middle of a project and reach a performance or capability impasse, it isn’t going to be fun to swap out renderers. Also, just the numbers game of so many different libraries and engines means it will be harder to find solutions and answers to development questions. I’m not sure HTML5 improves upon existing alternatives including Flash. HTML5 is free, but you are going to need potentially spend time and money to get to the state Flash is out of the box (currently). It really just seems to come down to preference and what platforms mean the most to you. As of this writing, with specific focus of game development, HTML5 developers are looking at reaching fewer users and not having as many capabilities as Flash. Going forward, the majority of experts closest to Flash and HTML5 think they will coexist with their unique specializations. While the technical capability to write a singular code base that is universally supported on all devices sounds like a panacea to developing cross platform, it is only a small part of the solution. Everyone seems to overlook that design, interfaces, and controls have entirely different needs and demands on users per device. Screen size, buttons, having a mouse or keyboard, touch screens, does you game get interrupted by phone calls, power and performance limitations, network speeds, adjusting for optional peripherals, and a host of other concerns rise once you start thinking about /everything/ that is out there. Even if your tech can effortlessly transition between devices, your product design might not, and if it does it probably suffers to serve the least common denominator. Something ‘working’ usually isn’t good enough; the ease of use it matters. Edit (March 30th, 2013): Another great article on the topic has been written by the author of greensock TweenMax, whose code I have used extensively in past projects. Also, for anyone that hates on Flash because they find flaws in the ActionScript language, I would like to point out that every language has its quirks.